Mapisa-Nqakula also paid tribute to 39 South African soldiers who died, since 2003, while serving under the auspices of the United Nations in other African countries. 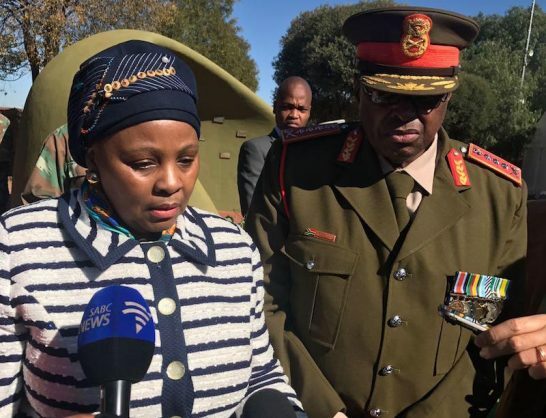 Defence minister Nosiviwe Mapisa-Nqakula on Monday charged members of the South African National Defence Force (SANDF) heading to the eastern Democratic Republic of Congo to stay away from local women while on the United Nations peacekeeping mission. “While we recognise the successes achieved by the FIB (Force Intervention Brigade) in neutralising M23 and other negative forces, there are matters of concern which I need to speak very candidly about. These matters have to do with our contingency in peace missions, especially in the DRC. These have to do with our being signatory to the UN resolution 13 25 which sharply speaks to the conduct of soldiers in peace missions,” she addressed more than 800 members heading to the volatile eastern DRC. She commanded the South African troops not “touch” the DRC women. “Whether there was consent or not, it is viewed as abuse of power because you are supposed to be the protectors of these women and civilians in the area where you are deployed. A civilian will not say no to you. Here you are, a big man in uniform, carrying a firearm — the women sometimes think they cannot say no to you,” said Mapisa-Nqakula. An advance team for the eight hundred soldiers is already in the DRC. The group will serve on a twelve months rotational period. Earlier the minister paid tribute to 39 South African soldiers who died, since 2003, while serving under the auspices of the United Nations in three African countries. “It [South Africa’s intervention into other African countries] has been worth it. In my budget vote speech last week I outlined what it has yielded. Firstly, in order for us to go into the African continent, even for investment purposes, you have to make sure that there is peace and security,” Mapisa-Nqakula said as she addressed journalists after a wreath-laying ceremony for the fallen soldiers at the Tempe military base in Bloemfontein. The event on Monday marked the 2017 International Day of UN Peacekeepers, and was dedicated in South Africa to honour and pay tribute to members of the South African National Defence Force (SANDF) who died while specifically serving under the United Nations flag. South Africa is a major contributor to the United Nations and African Union peacekeeping mission efforts, with annual contributions constantly fluctuating between 1,500 and 2,500 soldiers deployed. From September 2003 until December 2016, 39 SANDF members had lost their lives in the Democratic Republic of Congo, Burundi and Sudan. The commemoration on Monday coincided with a rotation of SANDF troops deployed in the DRC, as part of the UN Force Intervention Brigade.